If you haven’t been to Santorini in Greece then I highly recommend making the trip. Even better if you’re thinking about getting married in Santorini then the below images from Lowri and William’s wedding may help you make a decision. As a Destination Wedding Photographer I have traveled the world shooting weddings at some of the most amazing locations. I’ve met brilliant people and being able to create wedding photos that I love. Dramatic and creative wedding photography is what I do. Lowri and William decided on Santo Winery, a spectacular wedding venue with panoramic island view for their wedding ceremony. 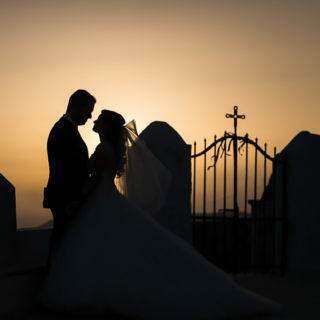 Santo Winery is a popular wedding ceremony venue in Santorini with breathtaking views of the volcano and Aegean Sea. The backdrop is one of the best I’ve ever seen. After the ceremony the couple and their guests made their way to Pyrgos Restaurant in the Panorama Room for their wedding breakfast. There are obviously a quite a few Santorini Wedding Photographers to choose from so being asked to fly out and be apart of Lowri and William’s big day was an honour. I would just like to say a huge thank you for everything you did to make Lowri and Will’s wedding day special. You made everyone feel relaxed and joined in with the banter throughout the day. You were amazing. I can’t wait to see the results of all your hard work. Enjoy the rest of your holiday.